Sapphires are our best-selling colored gemstone family for two key reasons: 1) they come in every color of the rainbow and 2) sapphires are hard and tough enough to be worn on a daily basis- second only to diamonds in their hardness. We take great pride in our selection of sapphires. We have relationships with gem dealers and lapidaries in Sri Lanka, Thailand, East Africa, and even with some local collectors who occasionally sell their gems. The result is that we have sapphires in every color in sizes from ¼ -4cts regularly in stock and at extremely competitive pricing. 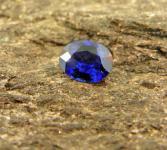 We also make sure to sell sapphires that are well cut. We often buy stones that are “native cut” by miners trying to save weight and then have them recut for added beauty. We feel that the loss in weight is more than justified by the added brilliance. Since the 1920s the majority of blue sapphires that have been mined have been from Thailand and Australia. While these mines have made sapphires more affordable, they have also done the jewelry world a disservice because the sapphire quality from these locations is quite low. Alas most sapphires seen in jewelry stores today are overly dark blue, tending on black, with low clarity, and the ones that are actually blue are lab created, not natural. Our stones are always natural earth-mined sapphires. While 99% of the sapphires on the market have been treated in some way (frequently with heat to darken color or remove flaws) most of ours are TOTALLY natural: not enhanced in any way. The majority of the sapphires we sell are from Sri Lanka where they are both mined and found in riverbeds. These stones range from very light sky blue, to the medium “cornflower blue,” and even medium-dark blue with hints of violet. We have recently started purchasing more stones from Madagascar and East Africa where top gem sapphires were discovered in the 1990s. These stones tend to have more color intensity than Sri Lankan stones and the rich velvet blue color is popular with clients looking for the text-book blue color. Once in a while we will carry the rare and collectible Burmese sapphire too, but these are nearly impossible to find in today’s market.The most popular blue sapphires we sell are the medium to medium-dark blue Sri Lankan (aka Ceylon) gems in the 1-2ct range. We go out of our way to find square cushion, round, and princess cut shapes that look good in either classic or modern settings. These gems are now being used more frequently in engagement rings- read more about that on our blog. We also try to carry the above blue violet color change sapphires. There are some very rare sapphires that appear blue outside or in fluorescent light, but appear violet or a rich purple under incandescent light. The color change is quite dramatic and in blended light situations the gems glows blue with flashes of red emanating from the gem. These are quite rare but are a particular favorite in our store. To the left is the same 1.85ct unheated sapphire in fluorescent and incandescent light. For our clients looking for a pink gem sapphire is the best option because they are easier to find than spinel, more pure than garnet, and harder than a tourmaline. They come in dark magenta, bubblegum pink, pastel rose pink, and every shade in between. For the lighter pinks we tend to source them from Tanzania where the Tunduru region is producing an amazing array of pastel hues in sapphire. Most of our medium and dark tones stones are either Sri Lankan or Madagascan. Some of our finest pink sapphires are neon pink where the intensity is unparalleled. We call these stones pink sapphire, but because they are colored by chromium (the same thing that colors rubies) many gem dealers sell them as rubies. We also carry the exceedingly rare color called padparadscha sapphire (a good photograph of them well is almost as elusive as the stones themselves, so you will have to come in to see them). Padparadscha means “lotus blossom” in Sinhalese and the stones get this name because the color is a delicate blend of pink and orange, just like its namesake. True padparadscha sapphires are only found in Sri Lanka as worn pebbles in river gravels which is like looking for a needle in a haystack. Recently there have been some East African stones sold as padparadshca, but they tend to have a brownish modifier. We sell these as sunset sapphires because they are gorgeous but not a true padparadscha. I have grouped these two shades of sapphire together because frequently the gem will be a blend of shades somewhere between orange and yellow. On one end of the spectrum are the lemon and straw yellow stones. These are the classic yellow gemstone and can be a dead ringer for a yellow diamond when cut well. True yellow sapphires are quite scarce, and due to their rarity they are good luck gems in Hindu culture. On the other end of the spectrum are intense orange (we liken them to Fanta) sapphires. These are most similar to spessartite garnet, but are a little harder for the person who wants to wear their stone in a ring. Most of these fancy sapphires are mined in Sri Lanka and Africa. Green sapphires are the favorite fancy colored sapphire of our owner. Unlike emeralds or tsavorites green sapphires never occur in a pure green hue. This is because green sapphires are colored by microscopic bands of blue and yellow that alternate in the stone and blend together to appear green. If there are more yellow bands the sapphire will be a forest green or pine green. In there are more blue bands the stone will be a beautiful teal color. Because the color zoning is not always even, a master cutter can orient the stone in such a way that it captures the light and will have unique character from every angle. When the green sapphires are darker they make excellent center stones in mens rings. Like other fancy sapphires, the majority of green gems come from Sri Lanka, although we get some from Australia and an increasing number from Madagascar. Just as color zoning can blend together to create green sapphires the zones can also be quite distinct. When this is the case the sapphire crystal will have more than one color, most commonly being blue + colorless, or blue + yellow, and rarely blue + pink or purple + orange. Some people prefer to see this bicolor nature as a 50/50 split, so we will carry these stones in emerald cuts where the color delineation is obvious. Other times we will buy bicolor sapphires that are cut in standard shapes, resulting in a unique blend of color that is quite interesting. Unfortunately the photographs do not show the bicolor very well, as the stones need to be moved to see the color accurately. Sometimes fine silk-like threads grow within the sapphire crystal oriented in three directions that match the hexagonal crystal structure of the sapphire. If the inclusions are oriented in just the right way and the stone is cut en cabochon the sapphire will reflect rays of light- like a 6-ray star. Usually star sapphires are opaque because the same inclusions that cause the star can make the stone cloudy. We try to find the rare examples that are gem quality, which means that the sapphire is translucent but still shows a sharp and strong star. The darker colored ones like blue and black make excellent men’s rings, while the lighter blues, pinks, and greys look good in classic mountings. These gems are found wherever sapphires are mined but represent a tiny fraction of the sapphires we see: a true collector gem. All of the above photos are of our current but ever-changing sapphire stock. Please contact us to view our collection. All of the photos are property of Federal Way Custom Jewelers.